The FamilyFarmed.org website educates consumers about the benefits of buying food that is healthier, environmentally sound, and supports local farmers. . On the site, consumers can gain access to information about producers, including a picture of the farm family or processor and a description of their products and growing methods. Ultimately, it will evolve into a portal with a broad level of information linking consumers with local producers, events, and advocacy. The FamilyFarmed.org label can be used on fresh fruits and vegetables as well as on processed foods. It includes the FamilyFarmed.org logo, the place of production (for example, Illinois or Chicago), and the name of the farmer or processor who created the product. The goal is to make it easy for consumers to immediately determine the name of the farm or processor and place of production. The labels are designed to send people to the website to encourage a deeper connection with the producer. In 2005, the Midwest region of Whole Foods Market is asking all their regional organic producers to use the FamilyFarmed.org label. Other Chicago area retailers are also expected to join the program. This will allow these supermarkets to easily promote their local products and send customers to the FamilyFarmed.org website in order to Know Your Food. Know Your Farmer. Fun and informative, the FamilyFarmed.org EXPO features about 100 exhibits, dozens of workshops, award-winning films, and delicious, healthy, local and organic food. More than half of the exhibitors are family farms from Illinois, Michigan, Wisconsin, Iowa, and Indiana. The first day of the EXPO is trade oriented and focuses on creating networks and forming relationships between farmers, restaurants, grocery stores and distributors. On the second day, the focus is on food and fun. Last year over 2,000 area consumers found that the FamilyFarmed.org EXPO is the one event in Chicago where food, farmers, families and friends all come together to learn about the health, economic, and environmental benefits of buying local organic products. 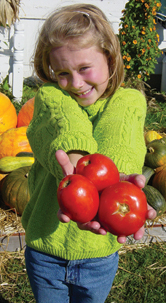 Participants have the opportunity to meet and greet local family farmers displaying and distributing their products. Local food businesses and organizations also have informative exhibits. Workshops will be held throughout the day to provide opportunities for learning more about food, farming, health and sustainability. Additionally the EXPO features chef demonstrations, food tastings, award-winning films, a bookstore and an interactive kids corner.